Home > Operations > Can I add a questionnaire to checkout? Q.Can I add a questionnaire to checkout? Yes. You can add up to 20 questions to Step 2 of checkout. 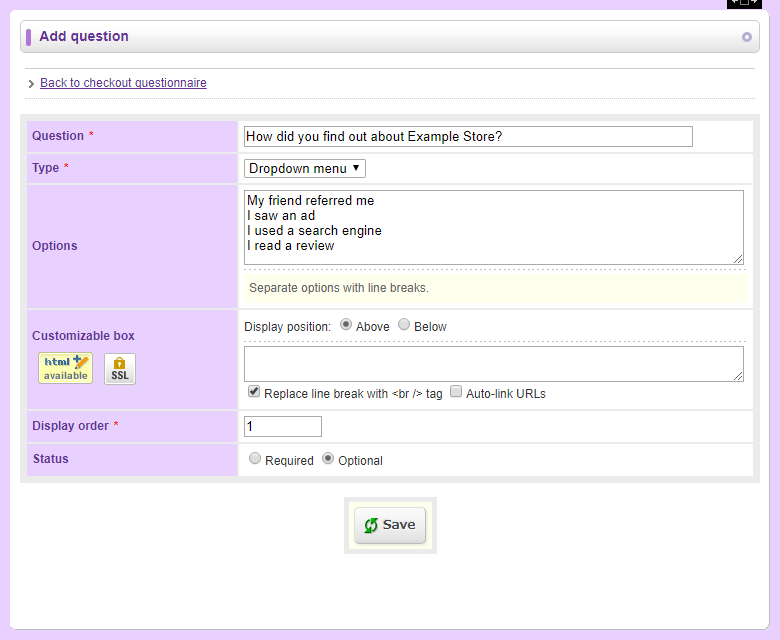 Navigate to Operations → Checkout questionnaire, and click Add question. Enter the question you wish to ask, and select a type. You can choose between five different types of questions: Text line, Text box, Checkboxes, Radio buttons, or Dropdown menu. You can also select whether the question should be mandatory. When selecting Checkboxes, Radio buttons, or Dropdown menu, input the options with line breaks.